Encountering God in our worship together through the Word and prayer. Equipping each other for service and ministry through groups and relationships. Engaging the world with the gospel of Jesus Christ through outreach and missions. Located in the Historic Brick District at 701 Court Street Fulton MO, 65251. 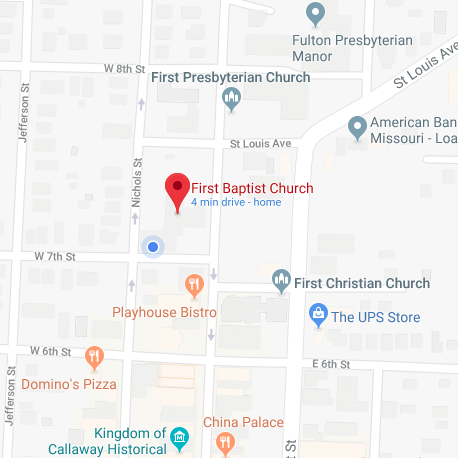 We have plenty of parking by our main entrance or feel free to park at the Boone County Library across the street, or the church annex at 619 Court Street. Summit Kids Meets Wednesdays at 6 PM-7:30PM. Get your kids involved. They will have a great time and learn about Jesus, his Word, and how to share him with others. We are happy to announce that on February 3 we called our next Lead Pastor Anthony Stephens. Pastor Stephens, His wife Naomi and kids Drew, Cole, and Sam are excited to be joining us in Fulton shortly. Easter is right around the corner and we can’t wait to celebrate by sharing the Gospel with our community through this fun event! The Easter Egg Hunt will be Sunday, April 14 at 3:00 PM at the Memorial Park Splash Pad, register below to come join us! VBS will be here before you know it and it will be a ton of fun! Vacation Bible School will be May 19th- May 23rd 5:30-8:30 and is available for all kids entering K through 6th grade. All registered kids enjoy free supper, crafts, games, and more!